That old quote that "All things old become new again" may in fact hold true, well sort of! We all know geeks love their nostalgic old PC's and gaming consoles. So it shouldn't come as a surprise that companies are starting to look at ways to cash in on that love affair with the past generations and Nintendo is looking to do just that. 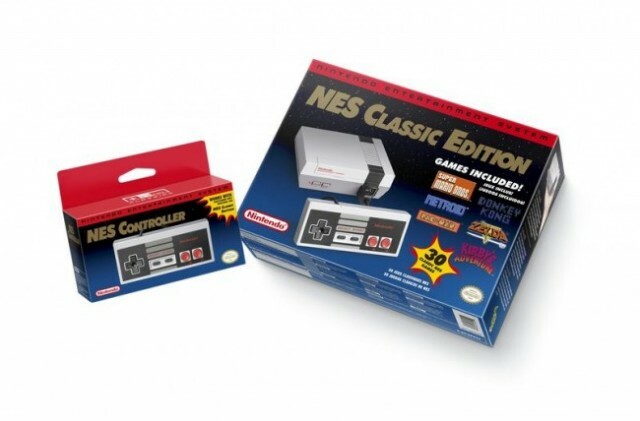 Nintendo Entertainment System has announced the new NES Classic Edition, a mini replica of the original console that will come packed with 30 of your favorite original Nintendo titles. For $59.99, you'll get the preloaded games, an HDMI cable, an AC adapter and one NES Classic Controller, which obviously looks exactly like the ones you're used to. Other details of the system are a bit sparse for now, so we don't know what the hardware looks like, or whether or not you can upgrade or add more games to the console over time. We also don't know overall storage capacity, yet Nintendo promises you can save games with multiple suspend points. The full list of games includes Balloon Fight, Bubble Bobble, Castlevania, Castlevania II: Simon's Quest, Donkey Kong, Donkey Kong Jr., Double Dragon II: The Revenge, Dr. Mario, Excitebike, Final Fantasy, Galaga, Ghosts' N Ghoblins, Gradius, Ice Climber, Kid Icarus, Kirby's Adventure, Mario Bros., Mega Man 2, Metroid, Ninja Gaiden, Pac-Man, Punch-Out!! Featuring Mr. Dream, StarTropics, SUPER C, Super Mario Bros., Super Mario Bros. 2, Super Mario Bros. 3, Tecmo Bowl, The Legend of Zelda and Zelda II: The Adventure of Link. Nintendo then responded by saying, “No. The console is a standalone device, so it cannot connect to the internet or any external storage devices. The 30 games included with the system were chosen to provide a wide variety of top-quality, long-lasting game-play experiences.” Given that, we don't expect to see official support for additional games or upgrades. However, we know that this doesn't mean that geeks out there won't stop there. So we fully expect to see some hacks down the road, to what extent those might be? We'll just have to wait and see! For more information, visit; http://nintendo.com/nes-classic.